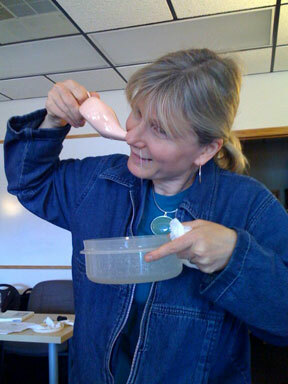 Today I'm showing a picture of myself demonstrating the netti pot. This marvelous little tool helps keep sinuses and nasal passages clear and well lubricated. Ahh, it's delightful to be able to breathe easy! I know it looks odd, but it works! You make a saline solution with 1/8 teaspoon salt and warm filtered water stirring until dissolved. Then tilt your head, and pour into your top nostril. The water travels up into your sinuses and out the other nostril pulling out any debris with it. Yes! Your two nostrils are connected! It is an easy practice that comes to us from ancient yoga tradition. Netti pots are available at health food stores. They are a great investment in your sinus health. When sick with a cold they are a godsend because it is possible to easily clean out all the muck that makes it so miserable to be sick. While I'm at it I'll recommend another book for all you miserable sinus sufferers out there: Sinus Survival by Dr. Ivker. I was among you for several years of my life and after I read this book I started down the road to wellness. Dr. Ivker gives many strategies for curing your sinus problems. Get a copy of this book if you or a loved one suffers with sinus problems! Some of you may be experiencing hand/wrist problems. This might take the form of pain, grip weakness, tingling and numbness, or other odd sensations. Maybe you work at a job that requires a lot of repetitive motion like typing, playing an instrument, or working with a nail gun or other construction tools. If you have a lot of stress in your life and/or job this adds another negative dimension to the situation. What can you do? 1. Change your perception about your body. It is not your enemy. It did not wake up this morning with the intention of making your day terrible! Actually, it is sending you cries for help. It is doing the best it can to accomplish what you are trying to do. Start to develop a kind image of your body; it is your partner for life! 2. Lower your stress level. Life stress tightens the entire body musculature just a little bit. This makes any muscular problem you are having that much worse. One of the best stress busters? Spend a few moments concentrating on your breathing. 3. Drink water. Everybody has heard this, but do you know why it helps body aches? If you are even a little dehydrated your body will pull water from your blood to maintain essential body processes. There is not a single process that does not require water, by the way. Your blood thickens a little and it is that much harder for it to get into the tightened tissues where you have pain. Dry and tight tissues are starved for nutrients, oxygen, and waste removal. Often my clients begin a regular water drinking program and their pain levels decrease by 50%. Don't go crazy as you can drink too much. But the 8-10 glasses per day is usually a very safe amount. And yes, I know it makes you use the bathroom a lot. Doesn't your body deserve a few minutes in the bathroom every hour or two with all the demands you place on it? And no, coffee, soda, alcohol, and juice do not really count. Nothing can replace clear water which requires no processing by your body, it can just go right in and do its work quickly and efficiently. 4. Stretch. If you are sitting at a desk all day with your arms and hands working in front of your body (i.e. computer work) you need to undo this position to regain muscle balance in the shoulder and forearm. The easiest way I've found to do this is to lay back on one of those big exercise balls everyone seems to have. Just lay back there and enjoy the feeling of gravity pulling your arms down toward the floor! It's easy and can be effective if done for only a minute or two per day! Of course yoga, tai chi, active isolated stretching are all also great programs to take up for feeling the best you will ever feel! It's a great investment in your life if you can get the time. 5. Take breaks. Check out this great website for easy yoga stretches to do right at your desk: Desk Break. 6. Get a massage and advice on how to use your work station the most efficiently for your body. Massage therapists can look at your posture and your work station to give you pointers here. Massage will warm, soften, and lengthen tough, hard, tight tissue. It feels wonderful and it can be the start to a new relationship with your body. There are more, but these will get you started. By the way, I bet you know someone you can print this for or send the link to our page. What a nice way to show them you are thinking about their plight and you care about them! Also, all the above suggestions are great for maintenance of healthy tissue! If you don't have problems, rejoice! And start working on prevention which is always easier than treatment of a problem. Have a good week. On Saturday, June 7th we supported the MACC Fund (Midwest Athletes Against Childhood Cancer) and their Trek 100 bicycle event with free massages for the 1000 cyclists. WSMT brought students, staff, and returning graduate professionals. Altogether we provided 230 massages. It was a great free treat for the cyclists who typically raise about $100,000 on that day! Unfortunately we were told to evacuate the WCTC campus 2 hours early due to extreme thunderstorms with hail and tornado potential. Next year we will undoubtedly provide even more massages if the weather cooperates! If you are a professional massage therapist in the area with interest in helping this great cause with a day of donated massage work contact us or the MACC Fund to join us next year. Recently I did a talk and demonstration of Craniosacral Therapy (CST) for our night class which is about to graduate. I have levels I & II training through the Upledger Institute http://www.upledger.com/ This wonderful modality allows the massage therapist to assist the client's body in normalizing the fluid flow around the brain and spinal cord. This fluid flow normally happens regularly on a minute-by-minute basis moving ever so subtly every part of the body as it flows. In the training one learns to detect this movement and then to work with the body to re-establish a smooth and regular flow if it has been disrupted. Many things can disrupt this normal pattern from traumas like car accidents to emotional situations like grief. People suffering from headaches, sleep problems, dizziness, unexplained aches and pains and other problems often experience great improvement from craniosacral work. A session of CST lasts about 60 minutes. Clients remain clothed and they lie on their backs throughout the session. Fees are typically similar to a massage session. At WSMT I am the only practitioner of this modality. Please call me (262-366-1840) if you are interested in a session or if you have questions. For massage therapists this modality is a great way to vary the stresses on your body. It is very light work, but you are fighting gravity to keep the work light enough, so it is a very different kind of stress than the compressive forces our hands and arms are usually exposed to. The whole world of the cerebral spinal fluid is fascinating and there is a very quiet listening aspect to this work which is centering and calming to the therapist. Check out the website for the Upledger Institute above. They run classes all over the world on a regular basis and it is easy to pick one up! Then he says, "Not too much." I like this one which is the big change for me, eating until you are about 80% full. And the last one, "Mostly plants." In the book he explains actually that by this he means mostly leaves, stems, and roots! This does not include seeds which is a lot of what we eat; think corn, wheat, rice: crackers, bread, cookies, cake, chips, tortillas, etc. I was fascinated by the realization that this plant part is designed to hold energy for the developing baby plant (fat) and that's partly why these foods can tend to pack the pounds onto us! This book reminds me of Real Food by Nina Planck, but written very clearly. Nina's book is more of a story of her relationship with food and how it has changed over the years. Both books, though, suggest the same ideas, of getting back to eating simple food, spending time cooking so you know what you're eating, and enjoying the good health from this way of living. If you want to be inspired this spring to get back to basics in the food department in order to regain good health and get off the commercialized food treadmill pick up either or both of these books. They are both easy to read and very motivating!